Pale, cold, slightly alcoholic and bitter. 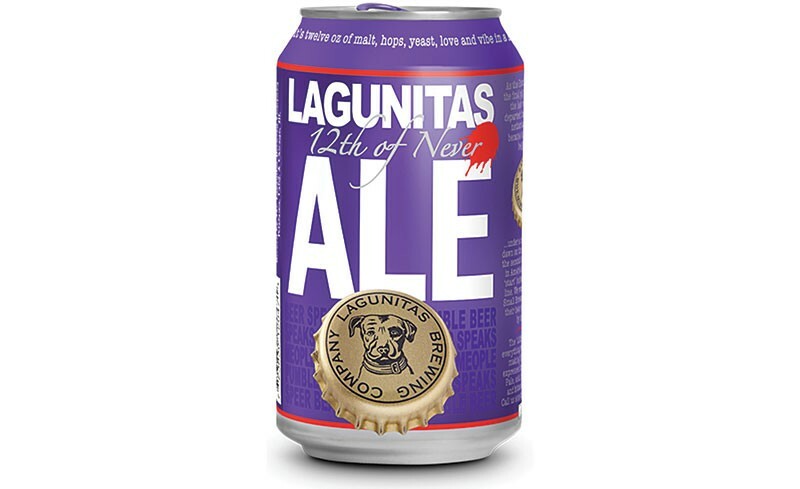 That's not a winner of an online dating profile, that's what Lagunitas Brewing Company has to say, with characteristic snark and whimsy, about its latest brew: a 12-ounce aluminum can of hoppiness called the 12th of Never. It was "never" meant to happen, at least according to Lagunitas founder Tony Magee, who lampooned environmental claims about canned beer in a 2012 Twitter diatribe. But in an email message from last July, specialty brewmaster at Lagunitas Mark Hughes coyly told the Bohemian, "It is hard to say 'never' about anything in brewing!" The can was coming. The aptly named 12th of Never pale ale was released this July in 12-ounce, purple "minikegs," i.e., aluminum cans. Billed as a pale ale with tropical notes, it's a hoppy one, that's for sure—crack the pop-top and pour it into a glass to get the best hit of that classic, piney California pale ale aroma (5.5 percent alcohol by volume). Then again, if I hadn't already evaluated my advance sample, which was shipped from the brewery's Chicago digs, I might have wanted to take it on the hike I went on the other day instead of meeting my deadline for this column—one of the key benefits of aluminum cans being packability. "We decided that beer lovers think cans are cool and recognize they can go places glass cannot," Magee says in the company's press release. Already, the can has been getting around. At the top of the mountain, I ran into someone I hadn't seen for years, and without prompting, he said, "I had this Lagunitas beer in a little purple can—it was really hoppy!" Meanwhile, new brews continue to clatter off the old glass bottling line. Lagunitas describes its Stoopid Wit (6.3 ABV) as a "Belgian-ish Wit-ly-esque-ish-ness brew," perhaps because they're cheekily self-conscious that their beers may seem like stylistic variations based on the same chassis. Some of that fruity, dried-banana, Belgian-style aroma does share the nose with those piney hop notes in this style-bridging beer, but it's all classic, dry California pale ale after that. A blast from the past in glass, the brewery's "WTF," or Wilco Tango Foxtrot, a "malty, robust, jobless recovery ale," has just been rereleased in 22-ounce bottles (7.85 ABV). While the premise is dated, with the days of jobless recovery replaced by, well, whatever this is that we're having now, a few glasses of this big, hoppy imperial brown ale will take the edge off any kind of trying times.